Shake your way into the holiday season with this ornament card. 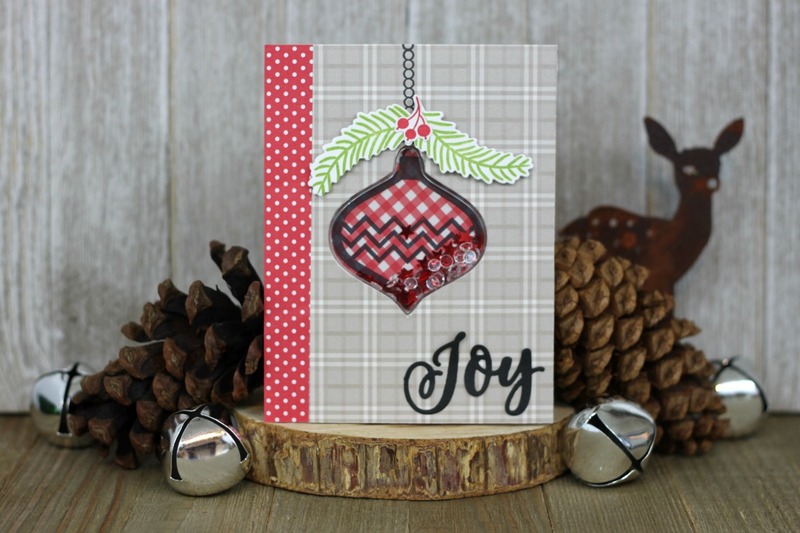 It’s from the new Jillibean Holiday Shaker collection and it is one of 12 new shaker card sets. This stamp and die set has sentiment stamps as well as the die cut Joy. To create the card use the die to cut out the ornament shape for the inner ornament background and then cut again for the gray plaid card base. Next stamp the ornament design in black ink and the ornament hanger. Then stamp the pine branches in green ink and the holly berries in red. Use the dies to cut them out and attach to the card base with foam dots. Select some fillers for the shaker, this card has new Holiday shaker fillers with red star sequins and clear iridescent dots. Last add the red dot border strip and die cut the joy from black cardstock. Just like that you are finished, now go spread some of your own joy!